Cedar City, UT, August 22, 2018 — Southern Utah University is excited to announce that after an extensive national search, Dr. Jean Boreen has been chosen to serve as the new Dean for the College of Humanities and Social Science. Dr. Boreen has over two decades of experience in administration and service at the university level. 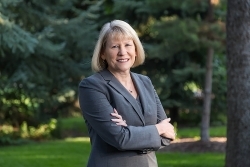 Her past academic appointments include Associate Dean for the College of Arts and Letters, chair of the English Department, and coordinator of the English education program at Northern Arizona University. Dr. Boreen’s scholarship has focused primarily on the mentoring of beginning teachers, both during the student teaching experience and in the first three years of teaching; she has co-authored several books and articles on this topic. Dr. Boreen also has a deep knowledge of young adult literature and has authored several articles on its use in secondary classrooms. Dr. Boreen has been a leader in professional organizations at the state and national level related to the teaching of English/Language Arts; further, she obtained approximately $500,000 in funded grants in support of professional development for Arizona English teachers. As the Dean of the College of Humanities and Social Sciences, Dr. Boreen will oversee the anthropology, communication, criminal justice, English, languages, history, philosophy, political science, psychology, public administration, secondary education and sociology programs. Boreen earned a BA in English and an MA in English (Literature) from Iowa State University. She earned a PhD in English Education from The University of Iowa.